The 80’s and early 90’s weren’t really a great period for Indian Cinema overall, Hindi Cinema or Bollywood as its more popularly referred to as in particular went through a torrid time those days. But when it came to Malayalam Cinema things were quite different, as it is the 80’s and early 90’s that are always referred to as the golden age of the industry. Of late there has been a proliferation of “new gen” films, films made usually by youngsters, a lot of them focusing on interesting and varied themes, but quite a few of them are also sadly inspired and even copied from various sources. However there are some of the recent Malayalam filmmakers who believe in not just making a good film, but who in some way are also trying to see if they can pay tribute to the golden age of Malayalam cinema, which gets reflected in their output as well. One such filmmaker perhaps is Basil Joseph who has now made a transition from short films to feature films with Kunjiramayanam. For any Malayalee living in Kerala there are a few things that are certainly part of life and they clearly take it for granted as well. Take for example the obsession with the Gulf, every single family worth their salt has someone or the other working in some part of the Middle East (simply referred to as Gulf) and every youngster is geared up and pushed to do the same. Ok this may not be a phenomenon that’s as prevalent as it was back in the 80’s and 90’s, nevertheless it’s a fact that Malayalees dominate the Indian community in the Gulf even today in terms of absolute numbers. Add to it the affinity to booze, a topic that’s under immense debate and discussion of late in Kerala. Quite comfortably the state overtook Punjab as the number 1 state in India in terms of alcohol consumption and continued maintaining the status, year after year. But last year the UDF Government went on to restrict the retailing and distribution of alcohol in the state with an eye on vote banks and an eventual shift towards prohibition. This has turned out to be a policy which has met with support and opposition, from multiple directions. A Malayalee wedding, especially a Hindu one has by far one of the simplest of the procedures in Indian weddings and is very efficient in terms of the time consumed. Nevertheless when it comes to organizing the wedding and the wedding feast in particular, there are way too many tongues wagging and people discussing, especially in the villages and smaller towns. Imagine a film which touches upon all these aspects and more, but not in a preachy mode but instead as a simple slice of life manner with humour as its main asset, now what would you think of such a film? Basil Joseph’s Kunjiramayanam is exactly a film like that. 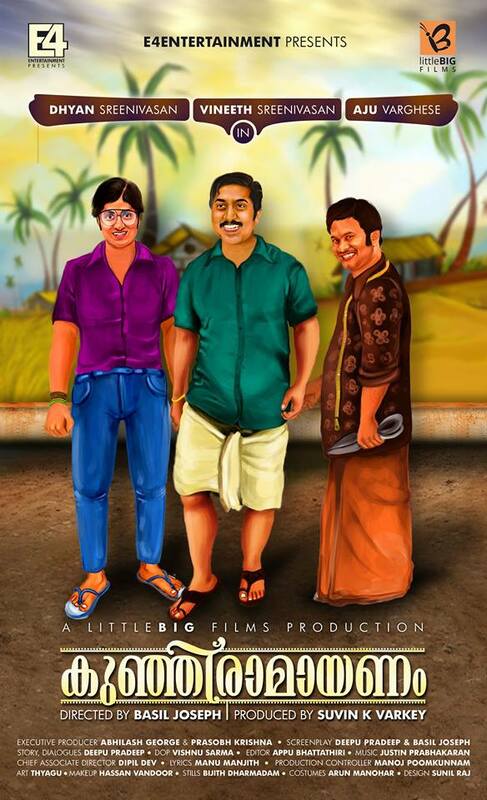 Based in the fictional village of Desam Kunjiramayanam is a tale that talks of Kunjiraman (Vineeth Sreenivasan) and his cousin Laalu (Dhyan Sreenivasan), their families, friends and people around them. A teenage prank of Laalu ends up in enmity not just between him and Kunjiraman, but also between Laalu’s dad, “Well Done” Vasu (Mamukkoya) and his sister Sumathi (Seema G.Nair), the mother of Kunjiraman.In the process Kunjiraman is unable to marry his “murapennu” Thankamani as he leaves to the Gulf. The rest of the film sees Kunjiraman visit Desam on various occasions, even as a series of incidents keep happening during and between these visits of Kunjiraman. Retro Style-“Thumba Poove Sundari” song ! The plot as such is quite simple, but what makes it endearing are the characters and the simple yet hilarious incidents that they keep facing, one after the other. Basil Joseph pays tribute to some of his own short films like “Oru Thundu Padam” and “Priyamvadha Katharayano” which is smartly done. For a change we witness a film which is based in a village, though the urban-rural divide in Kerala is fast diminishing. Despite the film being set in near contemporary times (the film starts with a VCD and VCD player being used) there is a lovely, old World feel to the tale. The costumes, styling and absence (?) of mobile phones, convey a feeling of a bygone era and the way the tale unfolds by itself makes you remember the family oriented comedy entertainers of the 80’s and early 90’s made by veterans like Sathyan Anthikkad. Also the use of authentic locations (in & around Kollengode in Palakkad district) adds to the charm of the film. Kunjiramayanam also shows us how widespread is the affinity of Malayalees to take up a job in the Gulf and their yearning to get back home at the first given opportunity. It also shows that boozing is not something to shy away from and is a social and cultural routine of sorts; however this angle is again explored as a spoof and not to promote or support binge drinking. The whole “Salsa” escapades, starting and ending with Kunjiraman’s involvement without his own knowledge is hilarious. It brings out the collective identity of Desam as well in a satirical manner. As much as the first half of the film revolves around Salsa and the problems associated with it, the second half is all about an alleged curse on marriages in the village and Kunjiraman’s attempts to get married. The mind-set of the villagers and their belief in rumours and superstition is also clearly seen without going overboard and Basil Joseph never approaches it in a judgmental fashion. Deepu Pradeep’s writing has ensured that despite the rather simple plot there are a lot of wonderful moments strewn throughout the film which keep the viewers engrossed. The scenes between Laalu and “Cutpiece” Kuttan (Aju Varghese) are a treat to watch, with Kuttan expressing his anguish in a subdued manner very effectively. Similarly the camaraderie between Kunjiraman, Kanjootan (Neeraj Madhav) and Sasi (Deepak Parambol) provides for a lot of laughter. Vishnu Sharma’s cinematography is effective; the village locales are captured in their natural glory. At a run time of 125 minutes, the film gets the length and pacing right, credit to Basil Joseph as well as editor Appu Bhattathiri for the same. Justin Prabhakaran’s songs are definitely an added attraction for the film, credit to the producer Suvin K.Varkey and the presenters of the film, E4 Entertainment to promote the film well, making good use of the songs in the process. There is a lot of variety in the 4 songs composed by Justin Prabhakaran, all of them written by Manu Manjith. The film begins in style with the cute “Paavada” song (sung by Daya Bijibal) while “Thumba Poove Sundari” (sung by Shankar Mahadevan) is a fun song where Kunjiraman is in a joyous mood as he prepares to get married. But my favourite song from the film is indeed “Salsa” (sung by Masala Coffee Band) which has a Christian prayer song like feel but is actually a number which sees the people of Desam, especially the youngsters crying over their craving for ‘Salsa’ :). The film benefits also from the casting as all the actors chosen are not only ideal for the characters that they portray but also come up with spirited performances. Veteran Mamukkoya is in fine form here and so are other senior actors- Indrans, Seema G.Nair and even Sudheer Karamana albeit in a small role. Dinesh Nair as the mad, drunk ex-Military man adds to the craziness of the village. Srinda Ashab, Bijukuttan, Hareesh are all good, while Deepak Parambol and Neeraj Madhav provide the ideal foil to the main characters. Aju Varghese doesn’t disappoint here as well, and his misfired attempt to spoil the wedding of Reshma (Sneha Unnikrishnan) and Kunjiraman brings the roof down. Dhyan Sreenivasan fits the part of Laalu, someone who is aimless and who keeps falling in and out of love easily. This is a big change for him compared to his debut role in Thira. Vineeth Sreenivasan is extremely credible as Kunjiraman, he brings subtle changes to his appearance and mannerism, never going overboard. To establish that he is quite well settled in the Gulf he is even seen sporting a paunch, lending the character the required natural touch. Biju Menon’s cameo gives the film the required punch and I liked the way the film ends, I wouldn’t spoil it for you by revealing what happens. Kunjiramayanam isn’t a path breaking film, and if you expect it to be so you could be disappointed. But it’s a film made with a lot of heart by a spirited young team led by Basil Joseph and eventually the film turns out to be one with a simple, old World charm, not seen too often these days. Go watch Kunjiraman, it’s good to laugh along with your friends or family as you watch this. Note- The film carries English subtitles by Vivek Ranjit but sadly the show I saw did not carry the same. I’ve been told by the presenters of the film, E4 Entertainment that audiences (outside Kerala) should insist that the theatre/multiplex play the film with subtitles in case you do not follow the language. So let that not be a deterrent for you to not watch the film. What ails Malayalam Cinema today? ← Welcome Back Movie Review: Is It Really Welcome Back?